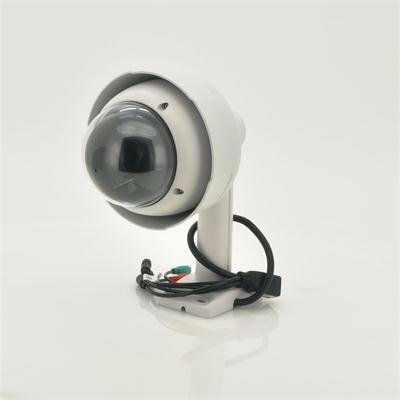 Successfully Added Speed Dome IP Camera - PTZ, 10x Optical Zoom to your Shopping Cart. Speed Dome IP Security Solution with PTZ Control, Sony CCD, Auto Iris Lens and 10x Optical Zoom for an affordable security solution to watch over your home, business and property. This Sony CCD Speed Dome IP camera allows you to pan and tilt at an incredible speed! Rotating at 200 degrees a second and tilting horizontally at 90 degrees, you won’t miss superman bolting past! Its motion detection will automatically detect moving objects and you’ll be able to zoom in at a great distance and in great detail with its amazing 10x optical zoom and H.264 compression. 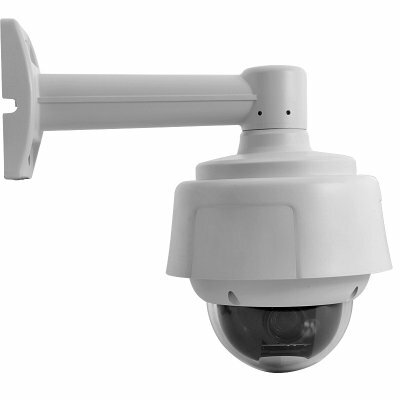 Encased in a hard, but lightweight plastic and aluminum alloy, this IP camera is built to withstand blunt force and vandalism, making it vandal resistant. Being an IP camera also means you can simply log in from anywhere in the world to check the security status of your home or business. Just plug in the camera's IP address into your web browser and you'll see an instant live feed of all that's going on. Not to mention, you can control the camera remotely and manage its whole array of functions including recording video, setting up motion detection alarms to alert directly from your Smartphone! This Sony CCD PTZ Camera with 10x Optical Zoom could easily sell for much more, but thanks to our strong purchasing power we can now bring you this amazing surveillance device at an unheard of factory direct low price! If you’re looking for a wired surveillance device with great performance, simplicity of use and at an affordable price, then look no further. Order now while supplies last, brought to you by Chinavasion.